Zaheera Jina Asvat: I enjoy writing rich in imagery and description. Clockwork Books has a bevy of very evocative writers, but here at the two I’d recommend for you: Things Unseen, by Pamela Powers and Relative Scale by Abi Godsell. Things Unseen will leave you with sometimes disturbing sometimes delightful images of a coherent world drawn from an existing suburb of Johannesburg, that will remain with you long after you finish the last page. The book contains some mature content, and so if you prefer to avoid serious themes of violence and murder, the sci-fi and fantasy short story anthology Relative Scale also paints worlds in richly descriptive words. To see the other prompts and responses that have been made in the public domain, just hit the Time and Trust button below. Thank you for sharing both with us. RealStories (the nifty new name for non-fiction that we are using here at Clockwork now, see Intern Abi’s explanation of why below), is the focus of this month’s newsletter. 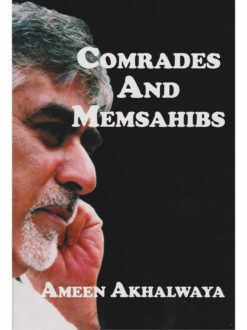 We have not one, but two reviews of local non-fiction titles: Speaking as I Want by Salim and Mishka Latib and Comrades and Memsahibs by Ameen Akhalwaya. If you can see from our reviews that these are the sort of stories that sing to your soul, you can nab them on special as the RealStories Bundle for just R250 for both books. We’re also running a RealStories competition on social media, because we like finding reasons to spoil our Facebook followers. To enter, just hit the CHANGE button (below the TIME AND TRUST button) and follow the instructions on the picture. You can win yourself a copy of Speaking as I Want. Keep an eye out for a hidden treasure in the Foreshadowing section. Clockwork Books is sitting on a secret! RealStories is Clockwork Book’s line of non-fiction titles, including Speaking as I Want and Comrades and Memsahibs, our two featured reads this month. This RealStories thing, it’s just non-fiction right? Technically yes. For the Clockwork Books line of non-fiction titles, we’ve started using the term RealStories instead of just talking about non-fiction. Nothing’s changed about the books, except what we’re calling them. Why don’t you just call a spade a spade and a non-fiction book a non-fiction book? Look, we’re not going to stop using the term non-fiction in the store, because that would be confusing. Why we think also using the term RealStories helps better capture an idea of what this group of books is and can be. We’re all for calling a spade a spade, until only calling it a spade means you tend to look down on the spade. If you think about it, its a little terrible that this entire group of books is first defined by NOT being fiction. So what does RealStories communicate about the books, other than that they are not fiction? We hope it communicates that these books are about places and people and events that existed and lived and happened. We hope that it better represents that this group contains everything from nail-biting biographies full of intrigue and courage, to field guides on the hardwood trees of Johannesburg. We hope it’s more inviting to new readers than Non-Fiction, which sounds a little dusty and academic. This father-daughter conversation is distilled into short, biting chapters that both illuminate and encourage the reader to question and keep questioning how South Africa’s political, social and economic worlds work, and how they could be better. Abi says: I like being shaken out of my comfort zone of unexamined beliefs and blind acceptances. This book does that and then some. It discusses abstract and complex understandings of the world and its systems of constraint and control, in a way that doesn’t belittle or patronize the reader, but instead urges them to engage with country around them. It paves the way for more people to find voices to ask questions with. Sarah says: Ameen Akhalwaya was a talented and courageous journalist, and I thoroughly enjoyed getting to know his work through this compilation of some of his best columns. Insightful, somewhat prescient political commentary features comfortably alongside cricket analysis (Ameen was a great fan of the game), shot-through with a keen and quick sense of humour. A great book to dip in and out of – keep it next to your bed! Cheerleader-in-Chief Sarah started Clockwork Books envisioning a publisher that bridged the gap between traditional publishing and self-publishing. The C-i-C loves reading, and South African books especially, so the idea of reading all day as a career really appealed to her. In reality, she really only gets to read in her ‘free’ time (she’s also a mum, so there’s not a lot of that), and her time is spent cheering on authors (Clockwork Books authors and others – she’s not biased), motivating the Clockwork Books team, and encouraging readers to keep reading. She wouldn’t change a damn thing. 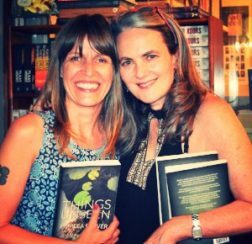 Clockwork Books would not exist without Sarah, and without her unwavering commitment to supporting new South African readers and writers. Her vision of what books and storytelling could be in this country is a thing of beauty and light. Thank you for walking with us as we follow her lead into a better publishing future. Like something, anything, everything about Clockwork Books publishing line or store? Want to be part of this powerhouse of paper and code? Or if you ever feel like just letting the CIC know that her warcries for local literature are being heard, just hit reply!